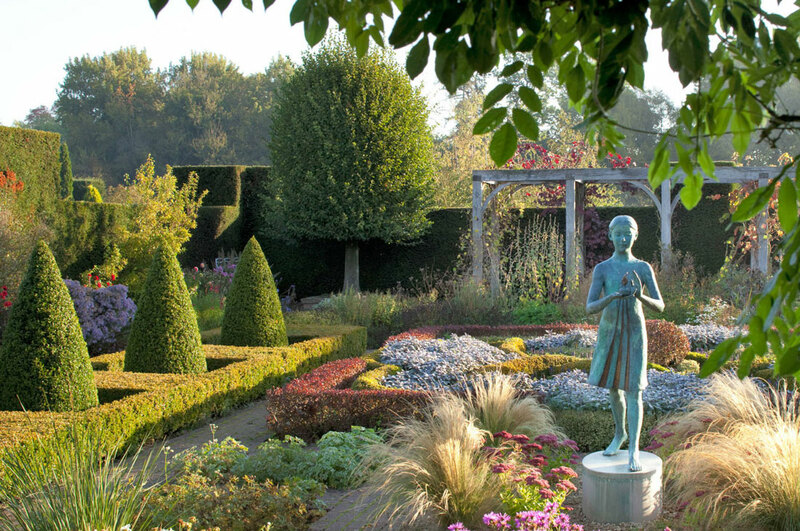 Particularly well known for the beauty of its gardens and for the length of its herbaceous border, Waterperry Gardens in Oxfordshire was once the home of Waterperry Horticultural School. Established in the 1930s by Beatrix Havergal and Avice Sanders, it was responsible for the education of many of our finest female horticulturalists. Although the school closed many years ago, Waterperry has continued to develop its gardens. Education continues to be important and many horticulture courses are run here every year. The Formal Garden was created by Bernard Saunders and Mary Spiller, a former student and then tutor at Waterperry Horticultural School. This peaceful space, watched over by Nathan David’s sculpture ‘Girl holding the Lamp of Wisdom’, is the perfect place in which to enjoy some silent reflection. Silent Space is now a permanent feature in The Formal Garden at Waterperry Gardens.